81 Wooden Balls, a part of Real Life Stories. The components that form any show by Ai Wei Wei hold a particular meaning and importance. Being named ‘the most dangerous man in art’ seems to elevate the sense of interception that his work imposes on any space; and of course, like everything else the location is integral. Consider the tactical decision to exhibit in Norway, after the Norwegian Nobel committee announced that the jailed Chinese dissident Liu Xiaobo was “the foremost symbol” of the human rights struggle in China, in 2010. Ai Wei Wei makes work that exists to make a statement, rather than to inform or provide a narrative. 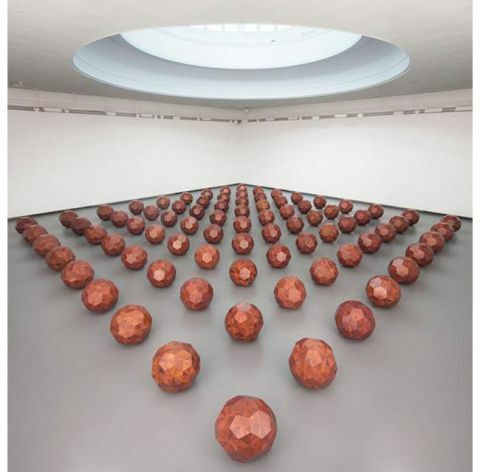 His recent installation in the ‘Kunstmuseum’ in Bergen is that of 81 Wooden Balls. Created using old Chinese craft-making techniques and requiring no glue, screws or nails, they represent a very staunch political expression. They’re a physical representation of the amount of days Ai Wei Wei was imprisoned for this spring; the precise, almost delicate way in which the balls are assembled culminate in a physically strong, polished and beautiful collaboration, denoting China’s ‘difficult’ political policies. The fragility of the constructions create a double entendre; if the keystone is removed, does the whole thing collapse? The high ceilings and sky light of the tower room, where the work is displayed simultaneously reflect a sense of escapism, and of imprisonment. The balls too are loaded with meaning. Their conception from a toy owned by Ai Wei Wei’s son gives the objects an innocence, or even a sense of ignorance. Notions of infinity are hinted at with their peculiarly near-spherical shape, and the arrangement of the objects in the space from above resemble military configuration. The recent discovery that traditional colours surrounded the tomb of the first emperor of China, Qin Shi Huang and Ai Wei Wei’s persistent interest in Chinese culture and heritage is echoed through the decisive geometric arrangements; reminiscent of the dormant statues of the Terracotta army. Not just the curatorial aspect of this work creates unease within the space. Rules are implemented on guests if they wish to view the work at all; blue plastic shoe covers are required to enter and once within the space there are more rules to adhere to. Intersecting the objects is not allowed, only moving clockwise or anti-clockwise around the perimeter. The objects take on a sort of anthropomorphism and begin to project an ideology of preservation, they resist interaction with an audience. They appear as an independent ‘islands’ or ‘zones’ and reflect Beijing’s contradictory inward-looking policies. The installation demands respect, is imposing on both the space and the audience and in a sense is a contradiction of it’s own. Ai Wei Wei has managed to capture an essence of both what he stands against and what he stands for, simultaneously dictating and liberating.